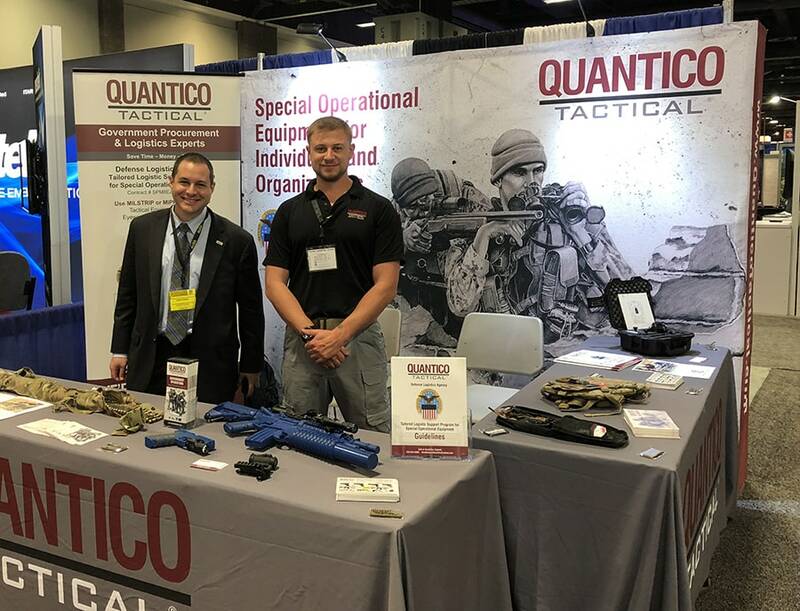 If you’re out at AUSA 2017, you need to get by Quantico Tactical (Booth #3542) and check out Gridless. In fact, you need to check out Gridless even if you’re not at AUSA. With all that’s going on in the world (riots, hurricanes, raging fires, and Arietta becoming a free agent) it’s more than just a “good notion” to be considering some sort of localized, independent power generation option superior to standard battery vaults — particularly if you’re an organization or agency that might be called upon to respond to (and function effectively in) an area where there isn’t any juice. 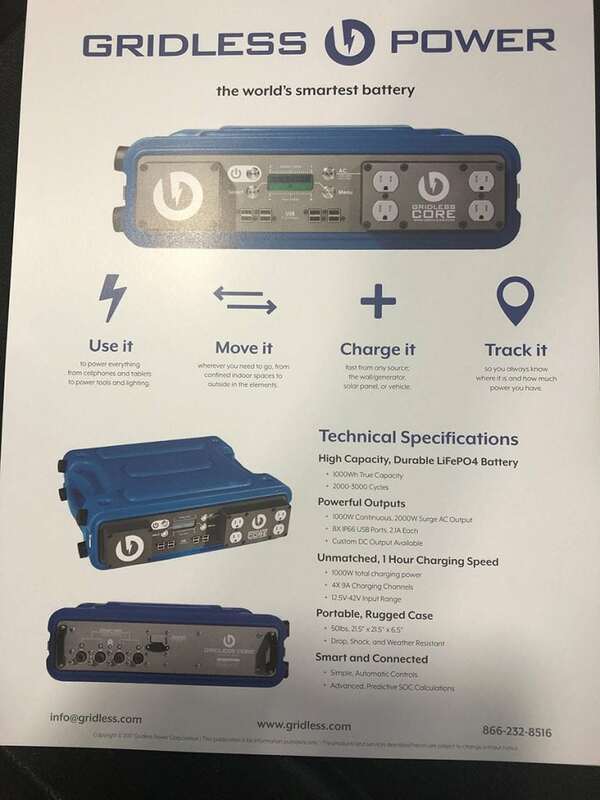 The CORE 7k, for instance, pushes 5kW continuous or 10kW surge AC output from eight USB ports and two twist lock outlets (+ 7000Wh True Capacity, + 2000-3000 Cycles). That’ll recharge your radios 200 or more times, soundlessly. Anyone that has ever had to work an area where they’re running generators constantly will appreciate that. This stuff is mutha-trukkin’ cool. Gridless was founded several years ago by Patrick Murphy and Jason Halpern. Its inspiration came from the need to bring power to remote agricultural locations (as in, the family farm). 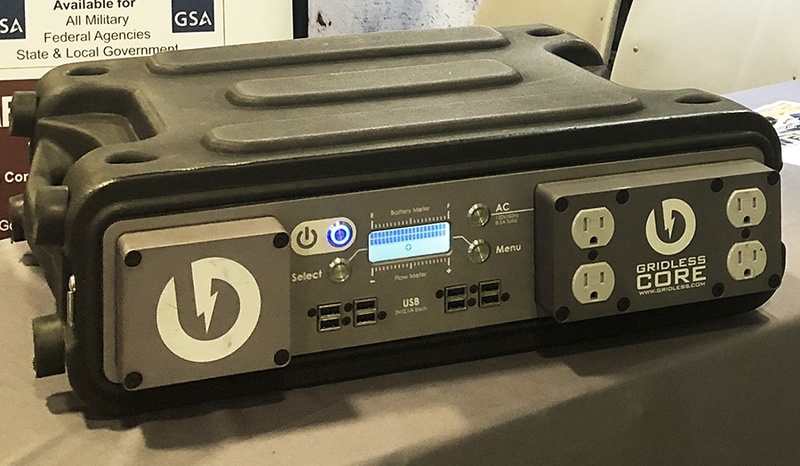 Before too much longer they were working on solar storage solutions for the US military, and then developed the Gridless CORE from modified Gridless units used to assist emergency responders working during Hurricane Sandy. Now it’s being used all over the world. 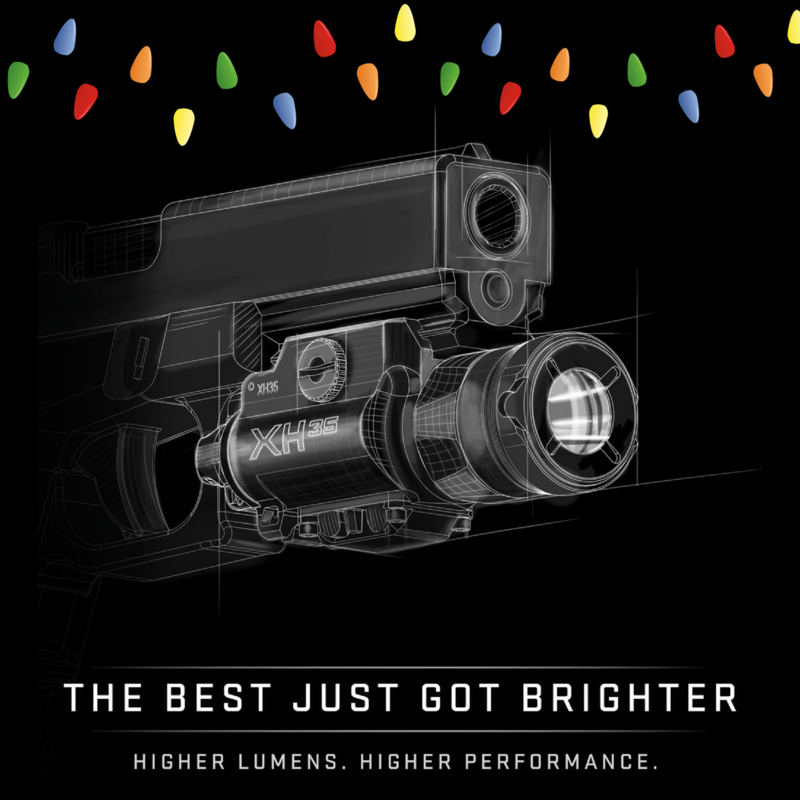 You can learn more from their FAQ or check ’em out on Facebook (/GridlessPower), but you’d be better served contacting Quantico Tactical directly. The FAQ is fairly limited and their FB hasn’t been updated since July. 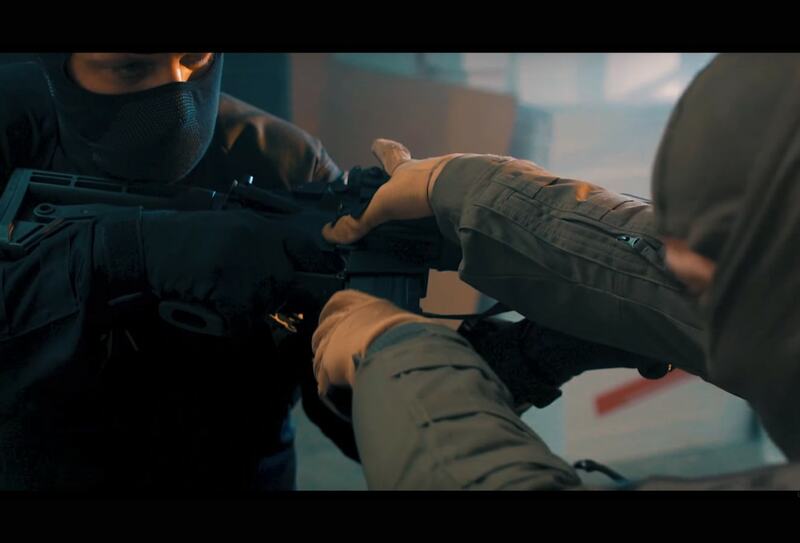 Just go direct with Quantico Tactical (http://www.quanticotactical.com/). They’re all over the Tailored Logistics Support Program, with a CAGE Code and DUNS number, GSA Schedule, DLA contract and all that other agency/unit stuff you need (though you can also purchase stuff individually). Perhaps more importantly, they’re a service disabled, veteran owned business with great customer service and even better taste in beer. No, really, they have great taste in beer. Anyway, Feds – go online here. You don’t even have to be wearing black sunglasses. Military personnel – you’ll click right here. State and Local boys and girls – you’re here. Individual/private purchasers – you’re here. Firefighters – you have a special page here. Alternately, if you prefer a brick & mortar, you can stroll into their Northern VA/Woodbridge store, Ft. Bragg/Aberdeen location, Ft. Hood/Killeen facility, Ft. Lewis/Tacoma outlet, or Ft. Riley/Junction City shop. 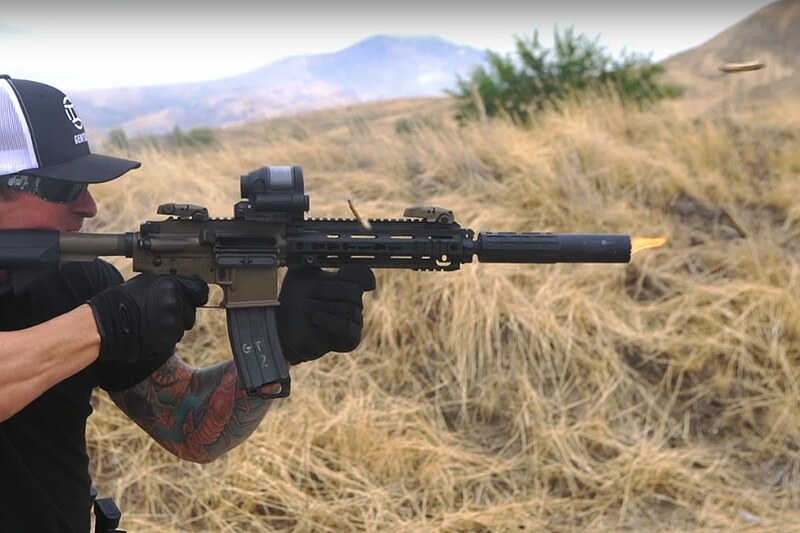 This article was brought to you tonight in its entirety by Quantico Tactical. Click the image to see what they carry (hint: it’s All The Things) or find ’em on Facebook, /QuanticoTactical/. 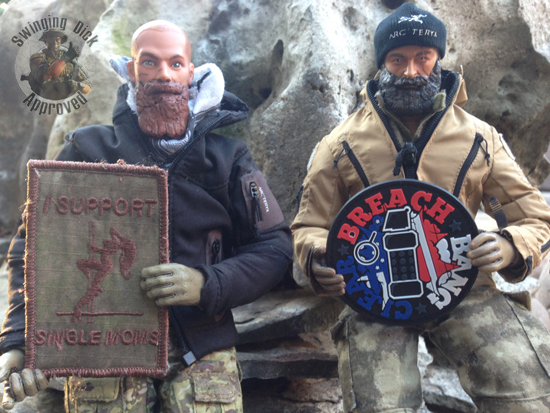 Quantico Tactical is a member of JTF Awesome – give ’em a look, nasties, they help us keep the lights on. This article was lovingly prepared for you by the Breach-Bang-Clear News Team. If you wish to share or repost, please so kind as to follow our terms and conditions. T&C: All original material published by Breach-Bang-Clear is the copywritten property of Breach-Bang-Clear, Inc. If you wish to repost, republish, or otherwise share our content, feel free to reproduce an extract of up to 225 words and one complete, unaltered image, preceded by attribution crediting the source and author’s name, to include a link to the Breach-Bang-Clear home page, with a link back to the full article on our website, BreachBangClear.com. You do not require our permission to do this. Please do not reproduce our content in its entirety without contacting us first. We do allow full syndication on a case by case basis (credited, and posted with a canonical link, as is common practice and in good form) but only when mutually agreed upon beforehand. If you wish to reproduce a complete article, please contact us for permission to publish first. 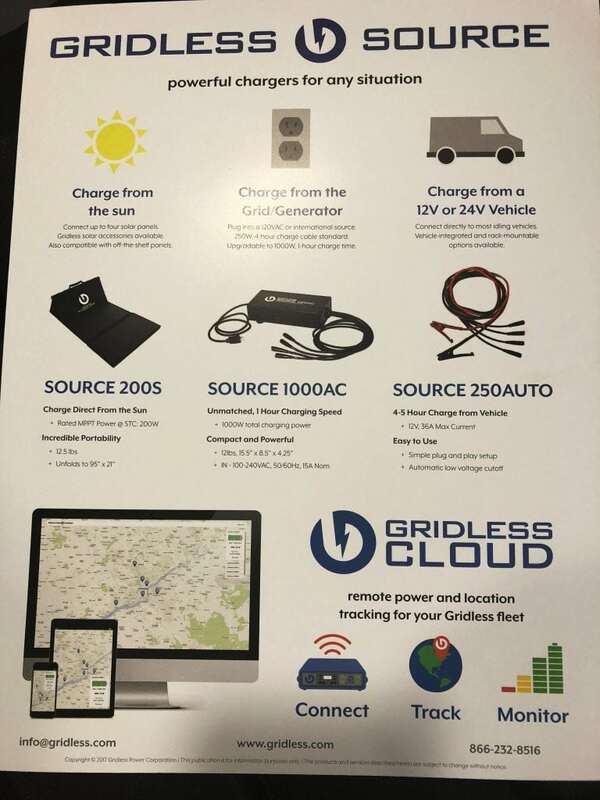 The products aren’t listed at quantico and at gridless it states they are only for sale to large organizations and governments. prices are not listed. I’ll second Leroy’s thumbs up!! I bought two Sigs from them a few months ago, and their military/police buyers program saved me literally hundreds of dollars off any of the comparable gun shops in the Killeen/Ft Hood area. I’ll never buy guns from any other store around here. 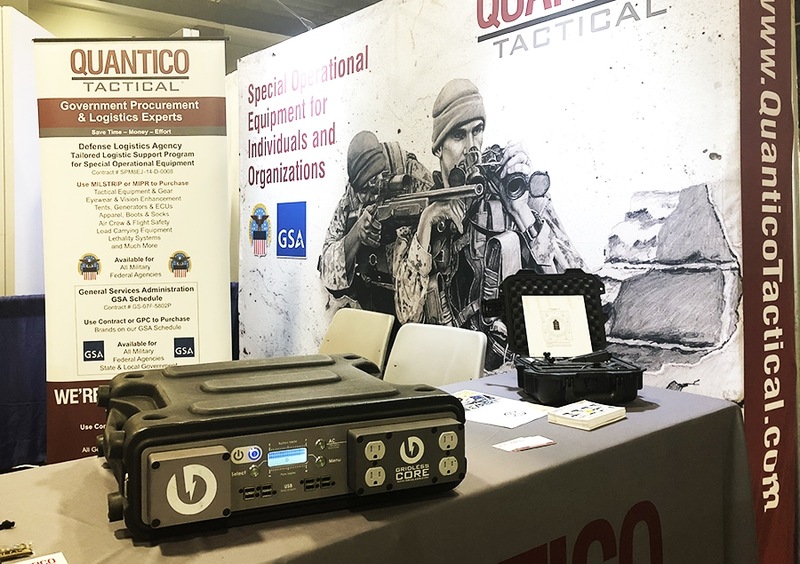 Go no use for the giant portable battery as I use solar panels and smaller battery packs for my personal life but I wanted to say Quantico tactical is awesome! Best prices on pmags and their sig program prices are unbeatable. Their stores aren’t half bad either. Check em out.